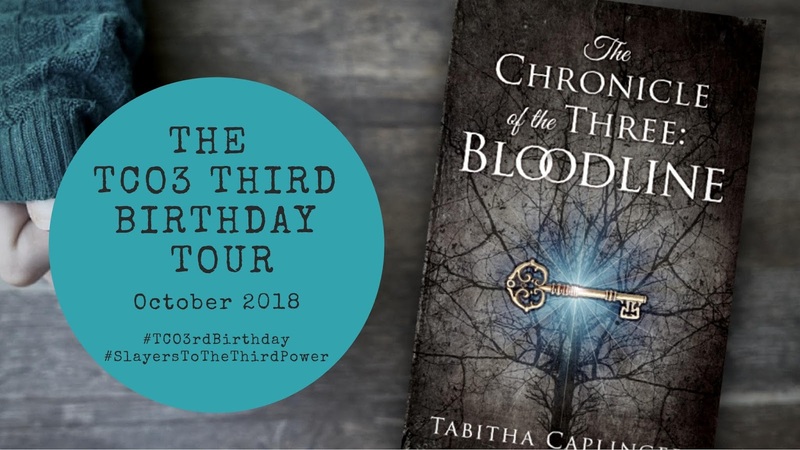 We are thrilled to welcome Tabitha Caplinger to Lands Uncharted today as part of her #TCO3rdBirthday Tour! 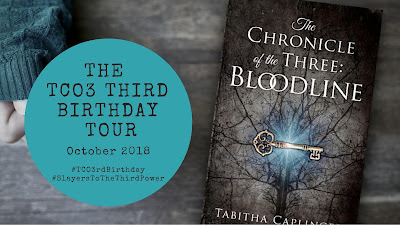 The first book in her series, Bloodline, is turning three this October, and she has events going all month long to celebrate! I'll let Tabitha explain more below, since she took the time to answer some interview questions for us :) Enjoy! 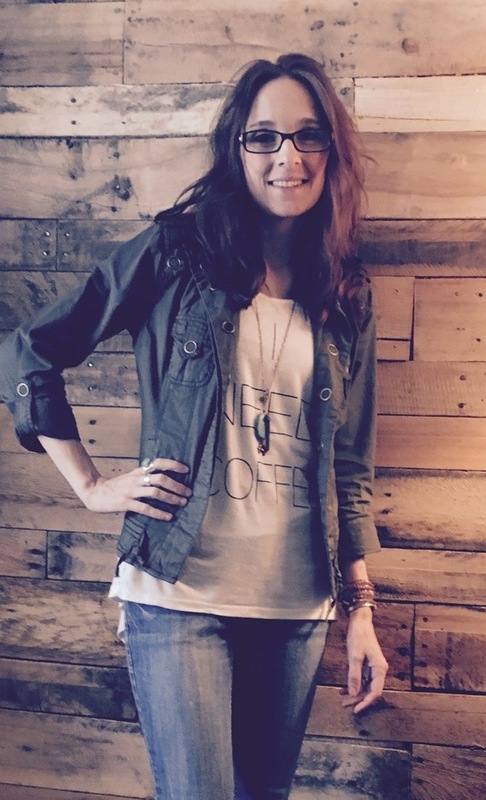 I’m a wife, mom, youth pastor, author and tv addict. My husband and I have been married for 16 years and have two beautiful and super-sassy daughters. Together we are the student pastors at Faith Community Church in House Springs, MO where we work with 6th grade all the way through college age students. We love it! When I’m not working or writing I love binge-watching. Some of my faves are Poldark and Supernatural. I also enjoy the occasional hike, a good cup of coffee and dark chocolate. Mmm, dark chocolate :) What prompted you to start writing? Are you one of those authors who knew you were meant to write since childhood, or did it come as a discovery later in life? As a child I wanted to be a paleontologist, then an equine veterinarian. In my high school years I started to feel the call to ministry but sort of ran from it for a bit. 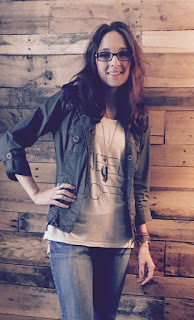 (Being a pastor’s daughter you see a side to ministry that isn’t always so glamorous and I wasn’t sure I could handle it at the time.) So I chose to attend Sweet Briar College and when they asked me to pick a major I chose creative writing. I have always had a big imagination and loved stories but I thought career-wise it would turn to journalism. God had other plans. For two semesters at Sweet Briar I took almost all writing classes. (I also took fencing which was fun cuz swords.) After that God pulled me back onto His path for my life and I left Sweet Briar to pursue becoming an ordained minister. Writing got put on the back burner until about 10 years ago when I put together a collection of essays about women in ministry roles. Through that journey I discovered all the things I did not know about publishing and that I didn’t want to write nonfiction. That’s where TCO3 came in. That sounds like quite a journey! Which fictional character (book or movie) do you most relate to, and why? Oh wow, that’s a tough one. I’m not sure I can pick one but if I absolutely have to I would say Claire from TCO3. (I swear I’m not just picking her because I wrote her.) A lot of people tell me I am Claire. I really didn’t try to write her to be me and in a lot of ways Claire is braver and more confident than I am. Plus I can’t really fight as well as she can though that one Krav Maga self defense class got me a step closer. I think I relate to Claire because I understand her struggle to balance helping everyone else and take care of herself. It’s easy in ministry and motherhood and marriage to always be pouring out of yourself. I work hard at finding the balance so I don’t burn out. Also I like coffee like Claire. I totally get the challenge of trying to find that balance. We’re all about exploring new worlds here at Lands Uncharted—if you could choose one place to visit, real or fictional, where would you go? Real- Sweden. My family is from there and my WIP is set in a scandinavian/Viking culture so visiting that area would be a dream. Fictional- Narnia, because who wouldn’t want to walk with Aslan? Both excellent choices! What advice would you share with an aspiring author? Do your homework. There is a lot to being an author besides writing. While you need to study your craft you also need to know about the publishing industry and marketing. I wish I had known more about all that earlier. I would also say, don’t try to be like someone else. Your success will come at a different speed and look different than everyone else. So don’t look too hard at what other authors are doing or how successful they are or seem. Focus on what you are doing, where you are at right now, and move at your own pace. I completely second all of that. 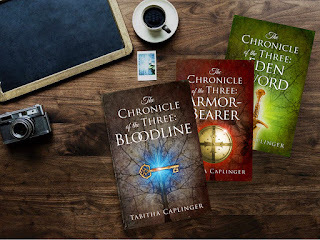 Bloodline, the first book in the Chronicle of the Three, is turning THREE! So exciting!! What do you have planned to celebrate? All the things!!! Every Tuesday in October I will be talking Bloodline fun facts, behind the scenes and bonus material LIVE on facebook. I will also be posting weekly challenges and questions and if you participate you could win weekly prizes. 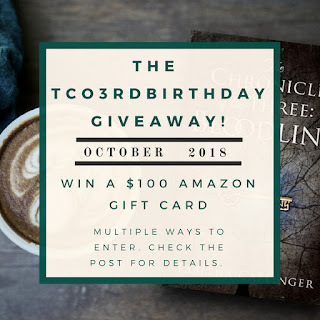 You also get extra entries for my BIG TCO3rdBirthday Giveaway. 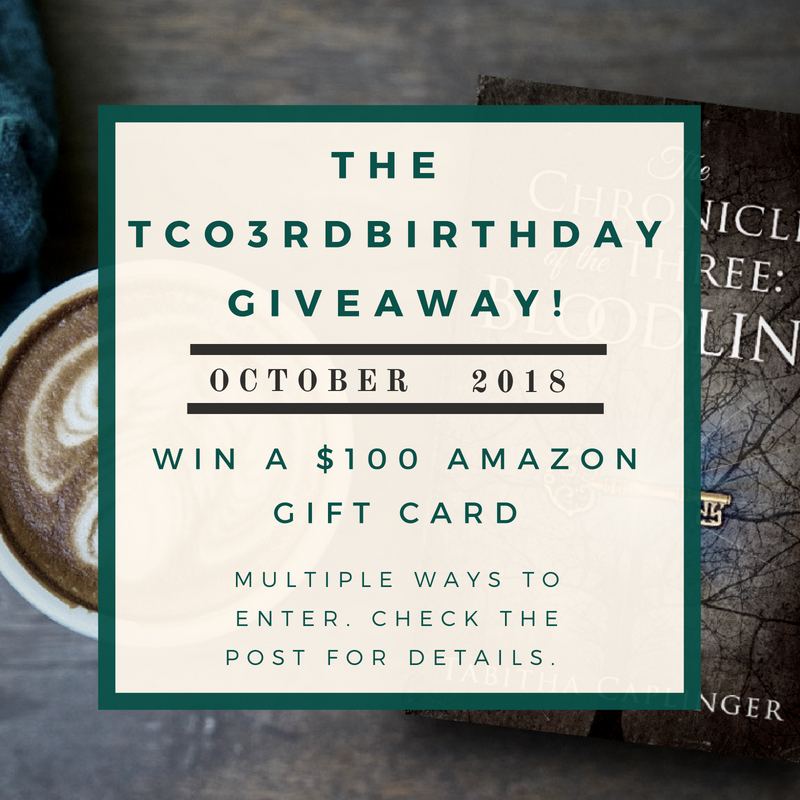 I am giving away signed copies, fun swag, free TCO3 merchandise and $100 Amazon gift card because what’s a birthday without presents? Wow, so much fun stuff! The Chronicle of the Three is full of heart, inspiration, and humor. What inspired you to write it? On a more specific note, I had a dream about this magical book with an elaborate golden lock that disappeared as it opened and the words automatically translated. I thought, what would that book be about? Who would read it? What would they find out? That’s how TCO3 was born. The magical book definitely left an impression on me, what a great inspiration! Did any of the events in the books surprise you as you were writing? So many of them. Since this is the first piece of fiction I had ever written it was kind of weird. Like, I’m the author, how can I not know what is going to happen? A lot of the big moments I had plotted out but a ton of little moments just happened as I wrote. A lot of how the characters were feeling in different scenes was a surprise too. But I loved it when that would happen. Those surprises definitely make writing more interesting! Can you give us any insights into your next project? My brain is swirling with ideas but I am spending this fall focusing on the first draft of what I am tentatively calling, The Wolf Queen. It is a fantasy set in a Viking-esque realm where a woman raised by wolves and who can see into the hearts of men must defeat a dragon before darkness destroys everyone. Ooh, I like the sound of that! No visit to Lands Uncharted is complete without Top 3s! Give us a Top 3 list, in the category of your choice! I will do my top 3 fictional duos. Love it! Thank you so much for stopping by to share with us today, Tabitha, and have fun with your #TCO3rdBirthday celebration! If you want to know more about these fabulous books, check out this Series Spotlight! You can find The Chronicle of the Three series on Amazon, iBooks, BookBub, Barnes & Noble, Kobo, and Goodreads. And we can't forget the giveaway!! Click the link below to go to the Rafflecopter - the prizes look amazing! Such a good interview. And I have read and loved the books. Great advice for aspiring authors! Happy book birthday, Tabitha!